Muhammad Ali, the legendary boxer, renowned for infamous phrases such as, “float like a butterfly, sting like a bee”, has often been quoted for his sharp wit. His public speaking has also recently become the focus of a study by speech scientists from Arizona State University (ASU), Visar Berisha and Julie Liss. Portrait of Muhammad Ali, 1967. Source: United States Library of Congress, Public Domain. The ASU scientists analysed Muhammad Ali’s public speaking as part of their research to detect early warning signs of neurological diseases. Muhammad Ali was diagnosed with Parkinson’s disease at the age of 42, with some attributing the onset of the disease to the repeated blows to the head that the athlete suffered over his boxing career. The neurodegenerative disease that you may have heard discussed with links to athletes and head trauma is chronic traumatic encephalography (CTE). CTE has been linked to neurological diseases such as Parkinson’s and Alzheimer’s disease. Neurological diseases are incredibly difficult to diagnose and detect, especially in the early stages. An accurate diagnosis is usually only the result of autopsy after death. What researchers, Visar Berisha and Julie Liss from ASU have been working on is studying speech patterns to develop a potential early warning system for such neurological diseases. Speech and language production provides a means to examine brain function due to the complex sequence of events that must occur for speech to be produced. We must first think of the words we wish to say, the order in which they will be said and then send signals to over 100 muscles to finally produce the speech. By studying the public speaking of Muhammad Ali, Berisha and Liss have determined that Ali exhibited significantly slower and slurred speech three years before he retired from the sport of boxing, and furthermore six years before he was eventually diagnosed with Parkinson’s. 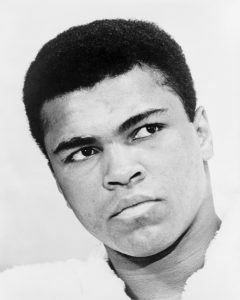 Berisha and Liss used computer algorithms to measure the rate of syllables per second that Ali would speak at, Ali’s speech slowed by 26 percent from age 26 to 39, a 13-year period. Source: Cpl. Megan L. Stiner, Public Domain. The study also looked at the correlation between the blows that Ali received in each fight and the rate at which his speech would deteriorate following the fight. One significant instance was the bout that Ali participated in against Earnie Shavers in 1977. Ali was on the receiving end of 266 punches by the end of 15 rounds, and his speech slowed by 16 percent after this one fight. Although his speech rate would recover somewhat with time after a fight, there was a long-term steady pattern of decline. The study demonstrates the potential use of long-term speech studies for people and athletes at high risk of neurological disease due to repeated head trauma. We now have a better understanding of the role that speech plays in neurological diseases, for instance 50% of people diagnosed with CTE show some signs of change in speech and language prior to diagnosis. This suggests that athletes and doctors can make more informed decisions about their health and safety if they are more informed of changes in their speech patterns. One potential solution with widespread applicability that Berisha and Liss have proposed is the development of a mobile phone application that would use your mobile to monitor your speech patterns and change in communication patterns, such as language in emails. This could act as a tool for detecting early neurological disease. The ESPN article that sparked this blog. Potential use of smartphones to diagnose neurological diseases. I’m not certain, from what I’ve read it is a combination of factors and genetics would likely play a role in that. 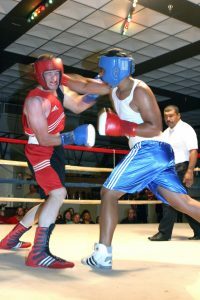 Parkinson’s obviously occurs in individuals who also don’t cop a barrage of blows to the cranium, but there’s certainly a high prevalence of neurological diseases in athletes who receive recurring head trauma. This is really interesting! Did some individuals like Muhammad Ali already have a genetic predisposition to Parkinson’s? Since the onset was really early at the age of 42!